"Your chance comes when the whirlwind lifts the pirate ship. Finish it in the sky!" In which the hero of a video game has to go up in the sky and defeat the enemy. It can be as simple as a dogfight between planes or airships, or as complex as fighting enemies at a flying fortress in an all-out war. If the heroes and their opponents have the power of Flight to achieve this, this will lead to Air Jousting. If they are falling from the sky instead, well, that's another trope. Common with Sky Pirates, and a leading cause of Disney Villain Death. Compare/contrast Rooftop Confrontation and Free-Fall Fight. 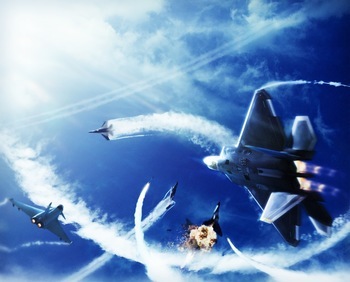 Ace Combat 2 and its remake Ace Combat: Assault Horizon Legacy both have a high-altitude mission, "Rising High," that takes place at the upper limits of the player's operational ceiling—meaning there's going to be a lot of stall warnings. Ace Combat 3: Electrosphere took the trope to its logical conclusion with a mission in orbit, aptly named "Zero Gravity" - the mission objective being the destruction of four enemy KillSats in three minutes, then angling the nose up at a certain angle to survive atmospheric reentry. Naturally, the player is not allowed to use their regular planes on this mission; instead, an R-352 Sepia Space Fighter is provided for this mission only, fitted with energy weapons that actually operate exactly like standard plane weapons. Interestingly enough for the franchise, the Sepia actually obeys Newtonian physics rather than aerodynamics and coasts sideways while turning, behaving quite realistically for that altitude. There is no upper altitude limit for the mission but the mission timer running out results in the Sepia being shot down by the satellites, while losing too much altitude before the satellites are destroyed results in the Sepia burning up from uncontrolled reentry. There's also a high-altitude mission in an SR-71 (or rather, a RF-12A). Ace Combat 5: The Unsung War has a rather late mission where the player is tasked with intercepting a Space Plane as it dips into the atmosphere to change direction via aerobraking, helped by internal sabotage of its aerodynamic control surfaces causing it to drop lower than planned by the antagonists so that the player can actually reach it. Final Fantasy I had the "Castle in the sky," an entire floating dungeon that is the home of Tiamat, the fourth fiend. Final Fantasy II's Big Bad raised his tower into the funnel of a great Cyclone, making it accessible only on the back of a flying dragon. Final Fantasy III is the only game in the series to have random encounters from the deck of your airship. Only happens in specific areas. Final Fantasy IV has two groups of flying enemies ambush the Red Wings (specifically, Cecil's command ship) as they return to Baron in the introduction. There's also the Tower of Zot, which isn't on the world map and involves airships flying higher than their normal level to reach it. Final Fantasy V has the party board the airship to invade the flying Ronka ruins —but first, they must contend with the automated defense systems. The boss battle is against the citadel's main gun. Final Fantasy VI had two particularly memorable iterations of this trope. The first when the party goes to attack the Floating Continent, and has to contend with the Imperial Air Force (which is explicitly given the acronym IAF which is never used again, probably because they're slaughtered about two hours later) culminating in a battle while falling against a boss. Then, later, the party must fight Doomgaze/Deathgaze as a randomly encountered enemy on the airship in the World of Ruin to get the Bahamut esper. There's also the time Sabin and Cyan are falling down a waterfall and piranhas attack them mid-fall. Final Fantasy VII has it as an optional fight against Ultima Weapon from the deck of the Highwind. There's also the fight in Advent Children against Bahamut SIN, which mainly consists of party members launching Cloud what seems to be several miles up in the air to hit said Bahamut head-on. Also done in Crisis Core, in the cutscene battle between Sephiroth, Genesis, and Angeal. After Genesis decides to go one-on-one with Sephiroth, the fight heads skyward. Final Fantasy VIII played this trope well: Balamb and Galbadia Gardens, both active and flying, launched a full-out war on one another. This, of course, leads to Squall punching out a Galbadian soldier while fighting for a jetpack... while hanging in mid-air. Final Fantasy IX presented a massive aerial battle where the Lindblum and Alexandrian fleets show up to protect the Invincible in the game's final hours. Final Fantasy X has two mid-air battles where the party fights on the airship's deck: first against Evrae, the guardian of Bevelle. Rikku and Tidus's Action Commands can have Cid pull away and shoot the Farenheit's missiles at it. Then there's a Sequential Boss battle against Sin, where the Farenheit goes head-on against the abomination and blows away two of its limbs with its primary cannons after the party has weakened them enough. There is also a Bonus Boss battle against Penance in the European/International version after you defeat all of the Dark Aeons. Final Fantasy XI: Chains of Promathia had a battle take place amongst an armada of airships. (Almost qualifying as a Scrappy Level, given the sheer unforgiving difficulty of the fight at the time and the farming of a mission-specific consumable to even stand a chance). There's also the final battle against Promathia, taking place in the celestial realm looking down upon Vana'diel. Considering all the work that goes into getting to this final mission, it is not a simple throw-away "this looks cool" setting, but the setting only heightens the gravitas of the mission. The celestial battleground also features a Bonus Boss which, before the introduction of The Treasures of Aht Urghan and Einherjar/Odin, was considered the most challenging BCNM-style battle in the game. May even still be the toughest six-man battle, but that's up to debate. Final Fantasy XII has the heroes infiltrate and do battle within enormous flying fortresses more than once. The Final Battle involves a long-running aerial battle/dogfight as the Imperial Armada and the Resistance Fleet (and their respective fighter ships) engage around Sky Fortress Bahamut, all while the protagonists fight the Final Boss at the very top of the fortress. Your character in Medal of Honor: Pacific Assault, en route to Guadalcanal, finds himself suddenly engaged in aerial combat, despite being a foot soldier. At first it's the same spin-the-business that you've grown used to, but before long you're flying the sucker into an assault on a base and another on an aircraft carrier. Smacks a bit of the improbable. You could defeat Byunei's Clone in Romancing SaGa 3 by joining forces with the Gwayne (child of Dora [Dragon that aided the Holy King to defeat Byunei; Gwayne could also be fought and defeated later]). The Final Boss Battle against Gruntilda in Banjo-Kazooie includes a part where the player has to use a flying pad to go after her while she flies in her broom. The second game has Mr. Patch, a giant inflatable dinosaur who forces you to fight him from the air. Despite having pegasus and dragon mounts in every game, it took until Radiant Dawn for there to be a flying-unit exclusive map in Fire Emblem. The Very Definitely Final Dungeon and the Final Boss of Breath of Fire III are located within Space Station "Myria". Sly Cooper does this in the third game, fighting against General Tsao atop bamboo stalks midway through the stage, then at the end of the level against a flying, animated dragon statue. In Sly 2: Band of Thieves, near the end when you fight Clock-La (Neyla in Clockwerk's body), you run across debris falling from a destroyed airship to rescue the rest of the gang. Eventually you fight her while crawling around on her back. In Chrono Trigger there is a boss battle that clearly fits this trope. In the battle, your party is fighting against the pilot of a small flying craft — while your party is on top of the craft, and the craft is flying over the clouds. Every level in the Star Fox series, except Star Fox Adventures and the on-foot/tank/underwater sections in the other games (though the last boss is fought in ships like any other Star Fox game, while the very first boss, impossible to lose to since the player will have unlimited life energy at that point, has this in the skies of Sauria). Advance Wars: Dual Strike had some missions with an air-only top screen. It also has several segments where you're required to do something in the air. Two of the levels are part ground, part Independence Day-like missions that involve you sending air units (jets, bombers, etc) to destroy the enemy's air support. Unfortunately, after the battle up there is over your air units are stuck in that location; you're given CO Power for each survivor, generally enough to give you a Tag Break. One of the later levels isn't necessarily this trope, but still requires you to destroy a satellite in space with ground-to-orbit missiles. Days of Ruin has a mission that you fought on the enemy's air fortress. One of the enemy's minions in the mission cut-scene lampshades the fact that you not only snuck on to the fortress, but somehow managed to bring along tanks and artillery. Aces Wild: Manic Brawling Action is a Beat 'em Up game built primarily around this trope. Dodging and attacking within the vicinity of an enemy or destroyable object moves your character closer towards that entity, even when they're higher up. Some parts of the game even require this of the player, including one part early on involving continuing an air combo to keep out of a pit of lava. Secret of Mana: Possibly a subversion as the final fight is you on a flying fortress being attacked by a dragon. Seiken Densetsu 3 has one of the God-Beasts fought atop Flammie. Strangely enough, Flammie is several times larger than the God-Beast, and she does nothing to help. It gets somewhat hilarious if you have Duran in your party and use any of his spells. Duran's magic casting animation involves him thrusting his sword into the ground. Poor Flammie. The last levels of Super Mario Land and final battle with Tatanga have Mario flying through the sky in an airplane. The Palace of Winds boss battle in The Legend of Zelda: The Minish Cap takes place who-knows-how-high in the air with Link riding the boss. How he gets off afterward is unclear. The Legend of Zelda: Twilight Princess has the battle against Argorok, a flying dragon, from the City in the Sky. You get to the city by shooting yourself up into the sky with a cannon. Once there, you climb to the top of the tallest tower on the entire floating island. At the top, you find several pillars, which you climb up on. From the top of those, you use the clawshot to hook onto some flying peahats to get even higher, and from there you use the clawshot again to get to the dragon. You better not suffer from acrophobia. The Legend of Zelda: Skyward Sword has Levias and the parasite controlling him, Bilocyte. The Legend of Zelda: Breath of the Wild has the fight against Divine Beast Vah Medoh, where Link gets a ride up above the machine with Teba and must destroy its cannons with Bomb Arrows while Teba draws away their fire. And then there is Skies of Arcadia - which is sort of 'all of the above', considering that all the ship battles are battles between flying pirate ships. Cruising around Floating Continents. And towards the end there surely is a climactic face-off with a flying fortress, too! Sonic And All Stars Racing Transformed even paid tribute to this in the Skies of Arcadia track, where racers race on a floating island that the Valuan Armada and Blue Rogues are battling around in their airships. It's so chaotic the track is decimated quite a bit, causing racers to fly into the sky and dodge mines the Valuans have launched into the air. In Phantasy Star I and Phantasy Star IV, you had to fight an evil king and the same evil king 2000 or so years later. Inside of his castle. On a flying island. In order to even get to the island in 1, you had to ride your Team Pet and fight a dragon in mid-air. Tales of Phantasia featured a special series of battles culminating in a boss fight that takes place in the air. Only Cless (riding on a Sleipnir Pegasus) and Arche (who normally flies anyway) could participate. Killer Instinct had several such battles, though for the most part they were atop buildings that were merely tall. The hidden Skybox stage was a simple square arena, suspended several thousand feet up in the air. Power Stone 2 has a level which started on an airship, the ship explodes, and you free fall until you reach the ground where you can continue the battle, grabbing the umbrella during the free falling segment is necessary since if you don't grab it, you take damage when you reach ground level. Super Mario World 2: Yoshi's Island has a battle against Raphael the Raven on the moon. While the Another Century's Episode series did feature a lot of air and space based combat, one High-Altitude Battle stands out in particular: The Final Boss of ACE 3 is the Shin Dragon from Getter Robo Armageddon, piloted by the game's Big Bad Berkt, in the combined skies of two Earths, each one caught in the other's gravity well. Both the Earths are rather easy to see, and the stage really is the ultimate expression of atmosphere (pun intended) that the series has. Seen several times in Sonic the Hedgehog, especially with bosses fought as Super Sonic. Sonic the Hedgehog 2, for one, does feature a level where you pilot the Tornado chasing after the Winged Fortress Zone, but there's no actual combat against a boss. Sonic 3 however includes an actual airborne boss fight in the Marble Garden Zone. It's difficult to defeat when playing as Tails. The first half of the final level in Metal Slug 3, as well as the Final Boss, which actually happens as you're both falling to Earth. On Super Mario 64, the third (and final) Bowser level is called "Bowser in the Sky". Super Mario Galaxy and Super Mario Galaxy 2 actually both take this further, as all of the battles with Bowser now take place in outer space. Lakithunder, the King Mook of Lakitus, is fought in the outdoors final segment of the castle of World 7, which is set in the sky. Same with Giga Lakitu in the second level of Super Mario Galaxy 2. New Super Mario Bros. Wii involves this with the battle against Ludwig Von Koopa in world 7. The castle and world itself is already in the sky, but the battle involves a fight on three moving platforms going quickly up a shaft. While the boss uses Yoshi's flutter jump and shoots five at once magic blasts at Mario and co.
Marvel Ultimate Alliance starts with a team of Marvel superheroes fighting off an invasion of the S.H.I.E.L.D. Helicarrier while it's flying. Wild ARMs 3 have you obtain the giant transforming dragon Lombardia. For most part, you're only using it for transport, and transforming some landscapes due to its rocket launcher utility weapon. After a particular event, culminating in a boss battle (plus a Side Quest), it is possible to do combat in midair. The mechanics are a little different, but stay similar to the main combat sequence on the ground (or on the sea of sands, for that matter). Shadow of the Colossus cranks up the awesome with two boss fights that require you to ride a colossus right into the air, holding on while you go for its weak points. Strangely averted in Persona 3. Despite the final battles taking place on top of a couple hundred-floor tower and against the moon itself, not once is the altitude of the scene brought into play. Persona 4 however, has a final battle taking place above the town of Inaba. There's also a boss fight in Heaven, but altitude there is only really the result of Fridge Logic. In The Elder Scrolls IV: Oblivion's Knights of the Nine expansion, the final battle with Big Bad Umaril the Unfeathered takes place in the sky a few thousand feet above Cyrodiil. (He has the support of a Daedric Prince, while you have the blessings of the Nine Divines.) Case in point, one player claimed he dropped an item during the battle and then went to check if it landed. It did. Metroid Prime 3: Corruption has Ghor fought in the hanger bay of Skytown, a futuristic city floating in the skies of Elysia. Dark Forces, Jedi Knight, Jedi Outcast, and Jedi Academy all had some variation on this: three of them have sequences that take place on Nar Shadaa, "the vertical city" (think Coruscant but moon-sized), complete with vast canyons between buildings, while the fourth has a mission that takes place on Coruscant itself. The first game features a level set in an airport, culminating in a boss battle atop an aircraft as it takes off. The craft climbs steadily (and quickly) during the battle, and starts falling after the boss's defeat. Afterward, the wreckage can be found at the beginning of another level. Done in X5 with most bosses. In fact, flying Mavericks have this as part of their norm. Mega Man X: Command Mission goes as far as to place its final boss battle in the upper reaches of Earth's atmosphere. In Kirby Super Star Ultra, you fight Kabula the zeppelin in the airspace of Mt. Dedede, with an Unexpected Gameplay Change to a shoot-em-up. Kaboola also appeared in the first game in the Kirby series. A mint leaf gives you the power to repeatedly spit out air puffs. An infinitely lasting version is what Kirby eats before he takes on the blimp. Also, every battle with Kracko takes place in a Bubbly Clouds arena, high in the sky. Devil May Cry's final battle is held on another plane of existence, starting in the sky. Chapter XII: The Broken Sky of Bayonetta. Once the boss fight of the level starts, however, the plane actually starts losing altitude. The final stage, in which you play as Jeanne, starts by having you ride a motorcycle up the pieces of a rocket taking off into space! You not only travel to the sky for this boss, you shoot right by it. The first boss of The Wonderful 101 puts you in command of the Virgin Victory chasing after Laambo; once you've caught up, you ride on the boss itself, who cranes its neck to fight you on its back! The entirety of Operation 003 is also in a high-altitude airport (a Strato Port), and it just keeps getting higher as you approach the boss! Every fight with Prince Vorkken barring the final battle with him in Operation 101 takes place on the back of his ship, The Meizerr. Stinkoman 20X6 does this twice. In level 3, Stinkoman finds a wall that he just barely can't jump over normally, and leaps into the stratosphere to get over it, having to collect gold nuggets to stop ascending, and slices of bread to finally land. Level 6 is an obvious cloud-themed level. At least one part of the final battle in both games consists of Sora magically floating/flying while navigating obstacles thrown by the boss in order to attack it. The reason he suddenly has the ability to do so is never explained. In the first game, he learned flight from Peter Pan (though why he only ever uses it in certain areas is never explained). In Kingdom Hearts II... well, technically, he's just falling. And never hitting the ground. The very last part of the Final Boss of 358/2 Days is fought somewhere around 50 meters above the ground. You're not flying or on any sort of contraption, the game just acts like the ground is considerably higher than it actually is. The visuals suggest some sort of barrier has been set up by the boss. The final battle of Scarlet Weather Rhapsody has you fighting a Celestial on the top of several stone pillars that spike beyond the atmosphere. How the human characters — or youkai, for that matter — could still breathe is never addressed. The true final stage of Imperishable Night takes place halfway between the Earth and the True Moon. Hisoutensoku also has you fighting against a Goddess of the Earth while falling down from the skies of Gensokyo. Although that doesn't stop her from throwing pillars of rocks at you. Stage 4 of Perfect Cherry Blossom is best described as "knockin' on Heaven's door". The majority of fights in Undenfined Fantastic Object take place while chasing or while inside the titular super-massive airship, which is planarshifting to Pandemonium. Inverted in Subterranean Animism and Ten Desires, which takes place Beneath the Earth. The Sky Garden in Illusion of Gaia floats high above the Nazca Lines and is the location of the second statue. The boss (and Point of No Return) is fought even higher, on a small, apparently free-falling platform. After beating the boss and getting the statue, you have to jump off and land on your cousin's airplane. Super Robot Wars can have battles between flying units, as well as entire stages in various flavors of outer space. Wing Commander III and Wing Commander IV subvert this, in that they are space combat games that require the player to descend into the sky (i.e. atmosphere) of multiple planets to accomplish plot-critical objectives. Needless to say, these special levels as a rule are much tougher than the conventional space battles seen elsewhere in the series. The Symbiote Vulture boss battle in Spider-Man: Web of Shadows cranks this trope to epically extreme levels as, considering the fact that you're Spidey, the battle takes place high above New York and quickly becomes a warzone when SHIELD troops arrive... and there is no ground. Therefore, you'll have to swing across hovercrafts and use air combos and web strikes on the Vulture and his mooks to keep up in the sky. Speaking of which, the game's final mission and boss is on the SHIELD Helicarrier. The last boss well, except for the bonus Harder Than Hard dungeon in Dragon Quest VIII. The fight against Orange in Gunstar Heroes. The Sega Genesis version of Rocket Knight Adventures has the entire last round set in a space station, which is made blatantly clear when the Pig King is fought in what appears to be a conservatory and Axel Gear is fought for the last time in a large glass room. Indeed, the very last battle with what is assumably the main computer running the Pig Army is defeated in a space jump by re-entry, as Sparkster is in an escape pod and thus unable to fight back, making him also an indestructable hunk of data. Rosenkreuzstilette has the fights against Luste and Iris. The Licensed Game for X-Men Origins: Wolverine has a level where you chase and destroy a Sentinel as it crashes down into the earth from high altitude (the battle practically took place on earth, but this qualifies for it's action sequence). Drakan had aerial battles between dragons. The protagonists of Nostalgia travel around the over world map in an airship. Needless to say, when they face the enemy sky pirate Scarlett, this trope takes effect. Happens in Drakengard on occasion; nearly all of the bosses in the first game were fought in flying missions. In Armored Core, the battle with AF Answerer is this if you want to avoid being nuked every two seconds. There are also three missions in For Answer that take place high above the clouds in the airspace of the Cradles, airships where humans live to avoid the contaminated Earth surface. One of these missions has you destroying the Cradles themselves. Assault Suits Valken has three: a dogfight during atmospheric reentry, a side-scrolling segment at the beginning of the fourth level, and a shuttle chase at the end of the same level. In World of Warcraft the gunship battle in Icecrown Citadel, in which players blast a gunship of the opposing side with cannons, defend it from teleporting boarders, and slay the mages that freeze their ship. The Halo series has several air combat sequences, with the sixth level of Halo: Reach being IN SPACE! In another level of Reach, you pilot a Future Copter between various destinations in New Alexandria. Kratos faces Erynnis' true form in such a battle in Ghost of Sparta. In the second game you'll have to slay the Dark Knight while riding the Pegasus. Einhänder has Schwarzgeist, whom you battle in the Thermosphere. Rockman 4 Minus Infinity has Mega Man fight Mothraya on Rush, combining this trope with Bullet Hell. Stage 2 of Granada is like this, taking place atop an enormous flying battleship. Falling off the edge is a regrettable misstep. The final boss battle of Perfect Dark Zero, is in a floating, fragmented amphitheatre/arena/coliseum. An earlier level has you steal an enemy jetpack. Granblue Fantasy has plenty of examples, as this trope applies to any fight that happens onboard the Granchypher, or raid battles that take place in the skies. Notable examples include Luminiera Omega, the four Primarchs, Belial, and Sandalphon. This also takes full effect in the anime when the crew faces off against an enraged Tiamat. The plane missions in Grand Theft Auto: San Andreas. The plane segment from Uncharted 3: Drake's Deception and a section of Columbia from BioShock Infinite are made into playable stages in Play Station All Stars Battle Royale. That same Uncharted stage later receives a visit from BioShock Infinite's Songbird battling the Vox Populi's blimp in which the players can get caught in the cross-fire, making this both a double High-Altitude Battle and Funny Background Event. In Jak 3: Wastelander, Jak takes an upgraded Hellcat to the skies to singlehandedly take on the floating war factory. Contra has several instances, many of which invoke Rule of Cool, Artistic License  Physics and Artistic License  Biology all at the same time. Stage 4 of Contra III starts out with a high speed motorbike chase on a highway, and ends with you grabbing onto a helicopter and riding several missiles being launched at an alien battleship, blasting away its energy shields while jumping from missile to missile for dear life. This sequence was later repeated in Shattered Soldier. The good end route in Contra: Hard Corps has you chasing down a multi-stage rocket carrying the Alien Cell bomb by riding on top of smaller rockets. Once you reach the main rocket, you proceed to climb up its sides while shooting at alien mutants bursting out of its hull, before reaching the warhead containment unit and fighting the Alien Cell itself. Destroying the creature causes the rocket to explode and throws you into the wild blue yonder...but thankfully you're rescued by the Air Police in the nick of time. In a less fantastical vein, the Big Magnum route of Hard Corps has the players face off against Colonel Bahamut's eponymous Alien Cell-powered superweapon platform located in the Earth's orbit. The heroes don't survive the battle, but they manage to take both Bahamut and the Alien Cell with them. Earth erects memorials of the Hard Corps to commemorate their Heroic Sacrifice. The final battle against Tiberius in Hard Corps: Uprising has you fall from the destroyed battleship while fighting his One-Winged Angel form. You have to use the fragments of the battleship in order to stay alive during the fight, but be careful, the fragments can be destroyed as well. The first boss of Contra: Rebirth has the players fight a giant alien centipede amidst the wreckage of a space station falling to Earth, itself a Call-Back to Neo Contra's final boss battle which involves fighting the giant head of Bill Rizer during atmospheric reentry while standing on a piece of space station wreckage. The True Final Boss fights of Contra III and Contra: Shattered Soldier are both fought while hanging from or standing on the heroes' aircraft. Can be invoked by the player in Terraria by building boss arenas, fortresses or sky bridges high into the stratosphere and engaging bosses there, most notably the Moon Lord. Xenonauts has a mini-game that is a simulation of an air battle between Earth fighters and alien ships. That often leads to a Low Altitude Battle, if the attacked UFO goes down. Pokémon X and Y introduces air battles, which any Pokemon that is flying-type or has Levitate as its ability can participate in. The True Final Boss of OmegaRuby and AlphaSapphire is fought in the upper atmosphere, where Earth ends and space begins. The third level of the Ninja Gaiden reboot is set on a Zeppelin, and the boss fight takes place on top of the airship. In Kingdom Hearts II, you get to fight Genie Jafar in the sky, far over the streets of Agrabah. This is one of the few mandatory bosses where Sora fights without any party members, though he rides the Magic Carpet, so it's not officially one-on-one. Sky Serpents consists of fighting giant serpents in the sky. Dark Souls II features a Bonus Boss in the form of the Ancient Dragon, who resides at the very top of the Dragon Shrine, a massive sanctuary built to overlook the Dragon Aerie, which is already high-up in the air compared to the rest of Drangleic. You'd better not stare at the near infinite void when wandering around the outskirts of the boss arena. The Matrix: Path of Neo: the last few levels are almost all battles in the sky. As soon as Mazinger-Z got a flying upgrade -right in that same episode- Kouji got a high-altitude battle against a rocket-shaped, missile-shooting Robeast. It was the first of many. In another episode, the enemy tried to force Kouji to fight several dozens of feet above the ground so that Kouji's body and Mazinger's machinery were unable to endure the physical strain. Great Mazinger: Tetsuya's giant robot had flight capablities since the beginning and several divisions of the enemy army had flier Robeasts. Often he had to fight very, very high. UFO Robo Grendizer: the titular Humongous Mecha is a space-ship, too. Often Duke dueled against the enemy space-ships directly at the upper limits of the atmosphere. The Yu-Gi-Oh! anime features a few examples, such as the Battle City Finals and the battle between the Egyptian Gods and the Great Leviathan. Likewise, Kaiba and Alister's duel was atop a plane. In Digimon Adventure V-Tamer 01, after Taichi collects all the V-Tags, Neo and him have a battle on a floating island. Mahou Sensei Negima! 's final battle of the School Festival arc was at approximately 4000 metres aboard a blimp which served as a final Place of Power. Fate/Zero has Gilgamesh in an ancient Hindu spaceship dog fighting Berseker on a magic-hijacked F 15 J. A few instances of this occur in Mai-Otome, notably Arika's last battles against Tomoe and Nina, the latter of which takes place several thousand feet above the planet. Yaiba seems rather fond of this, including battles against the Spiderman (fought on a floating airship, later on a massive web suspended above a road), Batguy (riding his pet vulture Shonosuke), Kotaro Fuuma (again, Shonosuke), Onimaru (using the flying powers of the Sword of Ryuujin), Gekko (Likewise) and Yamata no Orochi, with the monster itself serving as the battlefield for the final duel of Yaiba and Possessed!Onimaru. Ushio and Tora, since most Youkai can float or fly, this isn't uncommon. Notable examples include the battle against Fusuma (taking place on a plane), the duel between the Snake Demons Hitotsuki and Shibumori and of course, most of the battles against the Kokuen army made by Hakumen. The final battle against Hakumen itself takes place over the Japanese Sea and across the Japanese skies before it's finally forced in a barrier near Okinawa. Dungeon Keeper Ami features this in the early stages of the Battle of Dreadfog Island. Ami's airship navy against a levitating undead flotilla. Evangelion 303: The main characters are pilots of experimental jet fighters. Every battle so far has been a high-altitude duel. Asuka lost one, won another and drew a third fight. Last Child of Krypton: When a dozen N2 missiles are launched at the Geofront in order to destroy Zeruel, Shinji has a Heroic Second Wind and pulls the Angel into the stratosphere, drawing the missiles away from NERV. The resulting explosion sends him to the Moon. Superwomen of Eva 2: Lone Heir of Krypton: Asuka got one when she fought Brainiac's space-ship located at the stratosphere. The Bridge has the Climax Boss fight with Godzilla and Xenilla against Grand King Ghidorah, which ascends higher and higher up the atmosphere, concluding with a massive Beam-O-War practically in space. This happens in the climax to the Iron Man movie, and it serves a tactical purpose. In Captain America: The Winter Soldier The climax involves Falcon dodging gunship and jets but also helicarriers blasting each other out of the sky thanks to Maria Hill changing the helicarriers' targets. Superman and General Zod have one in Man of Steel. Subverted in Rio 2 — apparently, red and blue macaws like to resolve their issues through a game of air football. The Matrix Revolutions has this between Neo and Smith as part of the Final Battle. Barbarella: To get into the city of Sogo, Pygar the angel has to carry Barbarella while she shoots down the city's airships. The Final Battle of Spider-Man: Homecoming starts when Spidey tries to stop the Vulture from hijacking a plane carrying various pieces of Avengers technology, leading to them fighting on top of and around the plane in midair. The Big One sees the primary action take place at extremely high altitude (by WW2 standards) when the nuclear-armed B-36s evade German defenses by flying over them. The B-36s make their runs to the target at 50,000 feet plus, higher than any German fighter could reach. This is Truth in Television. In the prologue of Midnight Tides, the fifth book of the Malazan Book of the Fallen, the dragon shapeshifters Scabandari Bloodeye and Silchas Ruin, aided by the combined Tiste Andii and Tiste Edur suicide commandos, successfully attack the floating sky keeps manned by the K'Chain Nah'ruk to prevent them from coming to the aid of the K'Chain Che'Malle armies on the plain below. The dog-fight during the climax of Vengeance of the Iron Dwarf, third book of Companions Codex, has Drizzt facing off against Tiago while riding the backs of dragons. The fight is eventually won by severing the saddle straps that keeps Tiago on Arauthator's back and make him plummet toward the eath. Implied in Airborne Avenger, with the hero's flying jet-sled against the villain's army of hang-gliding mooks, anti-aircraft missiles, and assorted explosions on the playfield. In El Goonish Shive, the latter half of the battle between Grace and Damien is carried out in the air above the building known as "The Nest" with both of them using their abilities to fly. Adama vs. the centurion in the Battlestar Galactica: Razor webisode Free Fall. Thank goodness Adama remembered his parachute. Avatar: The Last Airbender has Zuko and Azula fighting on airships in "The Southern Raiders." Storm Hawks has plenty of battles between ships and aircraft, up and including the pilots of said aircraft getting into sword-fights as they tumble around! Almost from the beginning of military aviation, pilots have engaged in high-altitude battles. Even the comparatively primitive aircraft of WWI could operate at altitudes above 10,000ft. And of course there's the strategic high-altitude bombing campaign against Germany and Japan. Even today, air-to-air combat frequently occurs at high altitudes, and the importance of fighting from a perch is emphasized with the fighter pilot's saying: Altitude is Life. Altitude also gives one more time to either eject or regain control of one's aircraft in the event of damage. The largest single air battle in history occurred over the Russian battlefield of Kursk during Operation Citadel. The largest aerial campaign in history was the Battle of Britain. One candidate for the largest naval battle in history, the Battle of the Philippine Sea, featured nearly 2,000 planes (956 Allied, 750 Japanese) operating from 24 carriers and numerous airfields, and would be known as "The Great Marianas Turkey Shoot" due to the massively one-sided victory for the Allied airmen. The later Battle of Leyte Gulf would feature nearly 40 aircraft carriers on both sides, with again nearly 2,000 planes involved between both forces. World War II proved that whoever controlled the skies could control the battlefield.